While the resolution seems low at 320×240 this doesn’t look as bad as you would think.Â The image ends up being projected somewhere beyond your nose and appears to float in space.Â A higher resolution version is available at a considerably higher price, but I foresee using these for filming and maybe watching some TV shows and DVDs on the run, so it shouldn’t matter.Â One of the nicer features of these glasses is that you can still see around you, so you are not completely in the dark.Â The ear buds are comfortable and the sound is amazing, this is because they are manufactured by Ultimate Ears.Â While the description of the MyVu Solo Plus on the woot.com website mentions a volume control I have not located it yet. There are some Cons that you need to be aware of, the major one is that if you wear glasses and not contact lenses the picture will appear fuzzy.Â An attachment to fix this is available for around $100, but I would just rather get some contacts fitted.Â The other issue is that at 320×240 you can see between the scan lines, which is why I am sure higher resolution models where introduced.Â I am looking forward to getting my Microsoft Zune 120 in order to try these with a portable player.Â So far other than having to wear my glasses to see the screen clearly I really like them. If you think you are going to look cool in these just look at my picture, they are very unstylish, somewhere between looking like a cylon and LaForge from Star Trek 2nd Generation.Â The controls are easy to operate, other than that you have to hold the power button on for 5 seconds in order to turn them on.Â If the connector is not secured to the pendant they will shut off quickly. Initially I thought there was something wrong, but I wiggled a few wires and all was fine.Â Documentation was minimal at best with just a startup sheet; moreÂ documentation is available atÂ http://www.myvu.com. Â Charging the glasses is done by a standard USB cable and they were ready fairly quickly.Â The viewing time is supposed to be around 4 hours, but I have not confirmed this. I will try and add updates to this blog post as I play with these and let you know the results of my various tests.Â This was one of my few impulse buys lately, but I am afraid if I go to the woot.com website more often, I might succumb to more of these purchases.Â I posted the woot.com web address for the MyVu Solo Plus glasses below, although you will not be able to purchase them from this site, because the sale is now over. 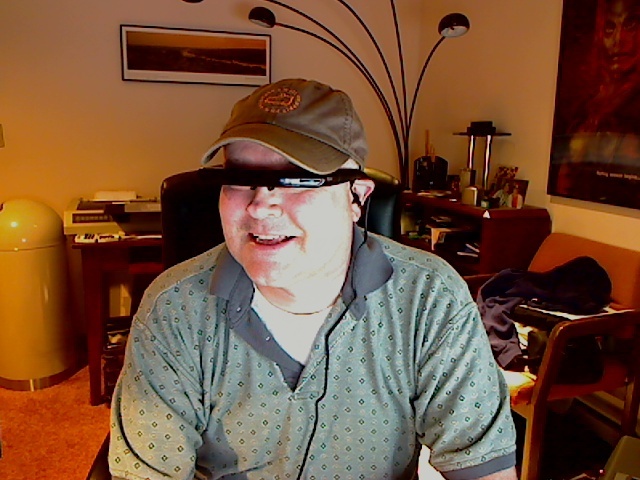 I have some Vuzix iWear and they are really great, especially in 3D. They work with all the iPod and iPhone variants, including stereo 3D and the screen size is biiigg! How about doing a comparison of these two? June I’m sure the Vuzix are superior to the version of myvu I reviewed here. The point of the article is that these are under $70. I don’t know which version of the Vuzix iWear you have but the cheapest one I found was $200. Yes I am waiting for the Zune to see how well they perform with a mobile device. I agree a volume control would be nice.